Hotels & B&Bs was posted on November 9th, 2011 and is filed under Breakfast, Recipes, Snacks, Travel, Vegan. This entry has 4 comments. You can follow any responses through the RSS 2.0 Comment Feed. It’s hard to believe that we’ve been on the road over seven weeks…it’s been a wonderful, exciting adventure I will never forget, but I will admit that there have been times when I have been a little bit homesick. Just a little.I think it’s when you’re not able to have your own space on top of being tired…that I start to feel pangs for my gigantic, purple bed at home. Which is why I really love staying at a nice hotel once in a while. Or a Bed and Breakfast. It’s just nice to have a little alone time and recharge your batteries for a few hours. Then I’m all good to go for doing concerts and spending time with wonderful people. We stayed at a beautiful B&B a few weeks ago when we went through Owen’s Sound, Ontario…it was called Between the Maples. The rooms were spacious, the beds fat with cozy blankets, and there were chocolates on the pillows! (so sweet…I want to do that with our guest room) If you’re ever in that area you must, must stay there! (tell them Colourful Palate sent you!) 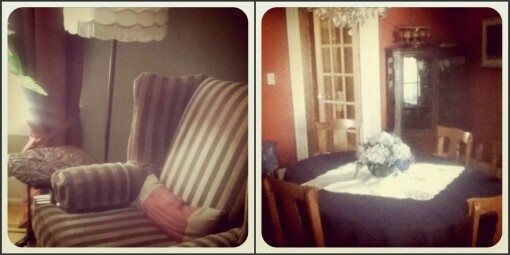 So here’s a little taste of one of best B&B places I’ve been too…in i-pod/i-phone photos. The next morning our hosts made us the most delicious breakfast. I ate more than I should’ve…but it really couldn’t be helped. Not at all. 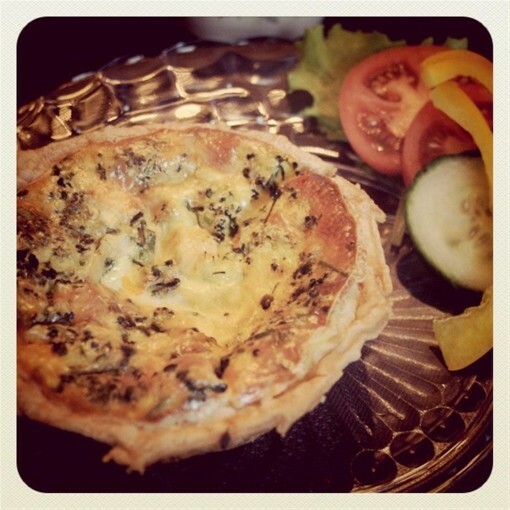 Doesn’t that quiche look amazing (and it’s homemade!)? She also served fat, buttery croissants with homemade jam…it was crazy decadent. Our host also made this amazing fruit salad with a special Ginger-Lime Infusion and she gave me permission to share the recipe with you (which was SO sweet of her!). 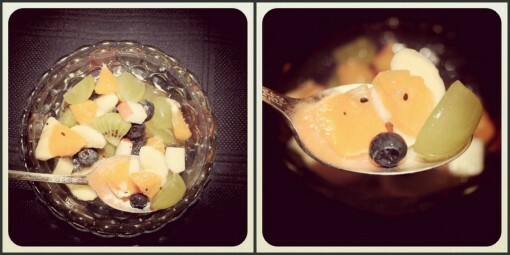 It’s the most delicious fruit salad I think I’ve ever had. The following recipe originates from The Duchess of Wellington B&B in Chatham! Put sugar, water, ginger & lime in 1 1/2 qt. pan. Simmer for 7 minutes. Remove from heat. Stir in lime juice. Strain into a sealer and cool. Store chilled, mix with fruit. 2 tbsp per serving – recipe makes 8 servings. 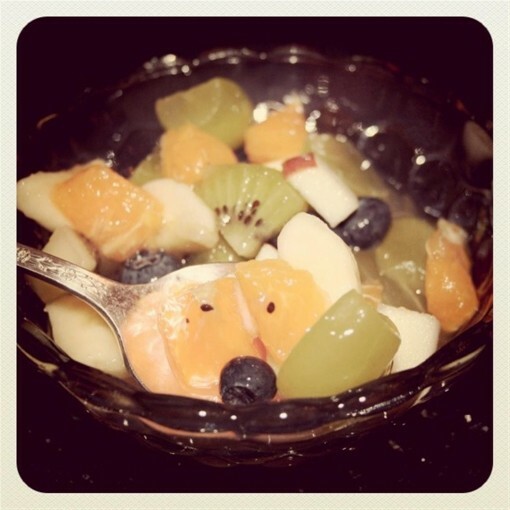 Use only non red fruit such as mangoes, kiwi, green grapes, blueberries, yellow raspberries…. Mix infusion and fruit gently, store overnight in fridge and serve cool for breakfast. Truly a unique taste treat!! It’s so crazy that we’ve been in almost every province of Canada at this point (during this tour) and it’s been so fun to explore the beauty of my amazing country! Have you been to Canada? Which do you prefer when traveling…hotels or B&Bs I just love the hominess of a Bed & Breakfast…there’s people to chat with at breakfast (and it’s always a way better breakfast than a hotel! ), beautiful décor in the rooms that make you feel like it’s not just a room with a mattress, and it’s just so cozy! Oh nice! And cool that you got a recipe from the B&B. We’ve stayed at a few B&B’s in California and CT during honeymoon/vacations – always so nice to wake up and have that amazing meal waiting for you. Hope you are enjoying the travel, even if you do miss your big purple bed (my favorite color btw) – when do you wrap up and head back home? I have always thought a bed and breakfast would be fun to run! Of course, I’ll have to learn to cook much better than I do now.